Trying my hand at flay lays. How do you like it? I hope to one day flat lay like the pros - Gh0stparties, Lydia Elise Millen, Hannah Gale and the like. They're trickier than they look! Anyway, this is like a snapshot into my wardrobe right now. 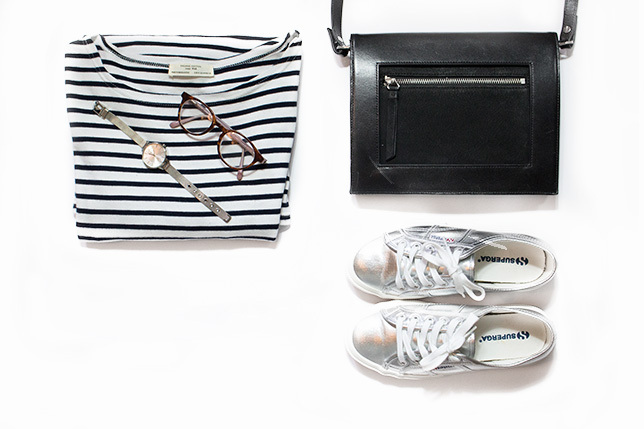 All over the stripes, box bags and silver shoes. I've fallen so hard for cute minimal, skandi style outfits (still trying to perfect these as well) and my Pinterest is just full of them. Gotta love a grey colour palette! How cute are the shoes though? They are from Superga, who have just opened a store here in Brighton. Before I'd only admired them from afar in The White Company, but I've finally got my hands on them and it's love. My brother thinks I look like Vince Noir when I wear them, but I think I just look fabulous. Plus they match my silver watch. What's not to love?